When it comes to five-star ratings for theme park attractions, we are discerning. A mere handful of rides make the cut. With Harry Potter and the Escape From Gringotts, the wizards at Universal Orlando have once again slain the proverbial dragon. It is an astonishing adventure that transports muggles into J.K. Rowling's magical world. Like Universal's other Wizarding World attraction, Harry Potter and the Forbidden Journey, Gringotts is a hoot from start to finish. Nobody enjoys waiting in long lines, but the pre-ride experience is so well designed and engaging, the tedium is tempered by the joy of discovering all the goodies. Located in Diagon Alley, guests start their journey by entering Gringotts Bank. (You can't miss it; it’s got an enormous fire-breathing dragoon on its roof. And yes, it periodically breathes fire.) The opulent lobby, with its vaulted ceiling, enormous chandeliers, and (faux) marble columns is breathtaking. Reproduced with doting attention to the Potter films, fans will surely have a deja vu moment as they take it all in. The many goblin tellers are especially remarkable. The animated characters count gold coins, make ledger entries, and otherwise silently go about their banking business. Every now and again they look up as if to acknowledge the muggles (Potter-speak for mortal humans) in their midst. The goblins’ fluid movements, facial expressions, and other details are quite impressive. When the attraction first opened, guests were able to freely walk about the lobby and mingle with the goblins (under the watchful eye of uniformed guards). Universal has since placed stanchions in the lobby to herd guests through. They can still get close enough to appreciate the impeccable craftsmanship, however. The head teller at the far end of the lobby occasionally talks to guests and instructs them to proceed through the hallway behind the lobby for a tour of the underground vaults. While making their way through the back corridors of the bank, “bank staff members” pull guests out of line, lead them to small rooms, and pose them for “security ID photos” using oversized, retro film cameras with large bellows. A photo is actually taken; guests can purchase them at the end of the ride. With the prices Universal charges, you might need to take a loan from Gringotts to afford a souvenir photo, however. Continuing down the corridor, guests see paintings of Gringotts founders and other luminaries. As in the queue for the Forbidden Journey ride, some of the paintings spring to life. The first hint that something is about to go “horribly wrong” during the tour (as it generally does in park attractions) occurs in the hallway. Silhouettes of Harry, Ron, and Hermione appear behind one of the office doors and can be heard conspiring. Hey! What are Harry, Ron, and Hermione Doing Here? It seems we have arrived at Gringotts bank for our innocent tour at precisely the same moment in the books and the films that the trio have come to the bank to recover a Horcrux and defeat Voldemort. It appears that we will be along for the ride, literally and figuratively, for this critical event. Oh oh. The muggles shuffle into Bill Weasley’s office for a pre-show expository presentation. Using the same kind of ultra-high-speed film technology as the Forbidden Journey pre-show and other attractions, projections of Weasley and a goblin appear nearly lifelike. They interact with actual props and set pieces to help add depth and credibility. The two indicate that they will be joining guests on the train ride into the vaults. The final part of the pre-show takes place in large “elevators.” They travel down to the deep underground vaults. We are not spoiling much by letting you know that the elevators don’t actually move an inch. During the press preview for Diagon Alley when we first tried to board Escape from Gringotts, the ride kept having technical difficulties. We made it all the way to the elevator when Universal closed the attraction for the evening. Operators opened both sides of the elevator doors, and we muggles walked straight through from the above-ground bank hallway to Gringotts’ vaults “nine miles underground” and then out a side door to Diagon Alley. The elevator effect, however, is pretty well done. It is reminiscent of the hyrdrolators, the phony elevators that used to take guests to the ocean depths in The Living Seas pavilion at Epcot. The Gringotts elevators are somewhat more believable, however. After arriving underground, guests pick up 3D “safety” googles and make their way up a flight of stairs to board the ride. 2-car coaster trains, each accommodating 12 passengers, await them. After the train departs, Bill Weasley and his goblin pal greet the group and offer to lead the way. But, the evil Bellatrix Lestrange arrives to thwart those plans. She directs a menacing blue bolt of nasty magic toward the train and sends it careening out of control. This is the high-speed coaster portion of the attraction. The train navigates a drop and some tight turns in the dark before mercifully stopping. Universal's designers work some new magic of their own. Just as Forbidden Journey broke ground with its robotic arm vehicles, the coaster trains on Gringotts introduce novel vehicle capabilities. Before coming to a complete stop, the two cars on the train independently rotate to the left so that passengers are facing forward towards a huge screen. This is the first time (we believe) that a coaster train has used a rotating platform for its cars. There are spinning coasters (such as Primeval Whirl at Disney’s Animal Kingdom), but they feature single car vehicles that freely and randomly spin. Later in the ride, the train’s chassis proceeds forward along the tracks, while its two cars remain sideways and eventually rotate back into place. It’s very disorienting and makes for a giddy ride experience. The visuals, using lustrous 4K high-definition, 3D imagery, is striking. With its breakthrough Spider-Man ride (and similar Transformers ride), Universal has improved roving motion base movie rides. Even more than those two attractions, Gringotts envelops guests in its grand-scale, wide screen sets. The hapless muggles encounter He-Who-Shall-not-Be-Named (AKA Voldemort; whoops, named him) in all of his wickedness. He and Bellatrix do their best to terrorize guests and cause collateral damage. They ultimately send the train on a (virtual) free fall to certain doom. Fortunately, we are privy to the pivotal moment when the Hogwarts trio outsmarts Voldermort and hightails it out of the vaults aboard the dragon. Harry and his pals take the trainload of innocent bystanders along to safety. Given the wild success and high bar set by Universal's first major Potter attraction, Forbidden Journey, the Wizarding World creators had enormous expectations placed on them. They have managed to deliver another delightful, awe-inspiring ride. By bringing the magic of Harry Potter to life, they showcase theme park magic at its best. Escape from Gringotts is one of the 12 Best Rides at Universal Orlando. The vehicle seats may not accommodate heavier guests with certain body types. Test seats are available prior to boarding. Loose items can be stowed in the free lockers next to the ride. Consider the single-rider line when the queue is long (which it is often). The wait should be approximately half the posted time for the regular line. As its name implies, you would likely not be able to ride with your party. You would also miss some of the pre-show features. 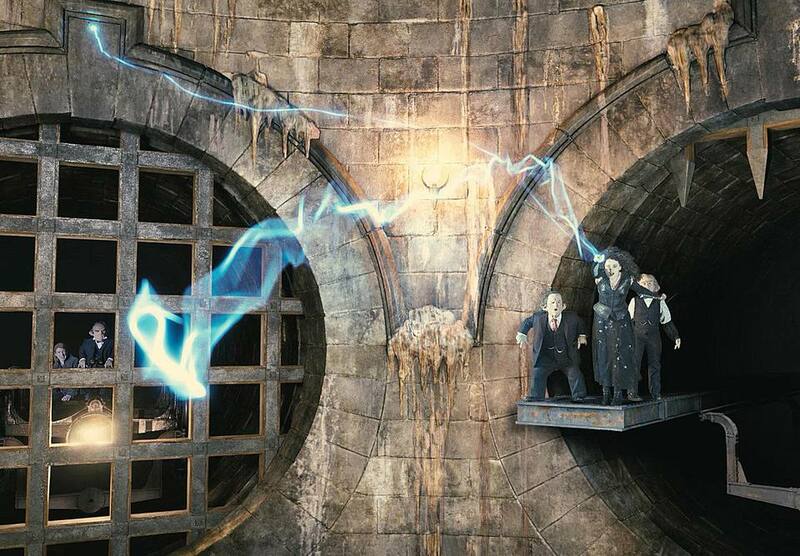 When Escape from Gringotts first opened, guests could not use Universal Express to bypass the lines. It is now part of the program. Guests staying at any of Universal’s on-property resorts get early admission to both of the Wizarding Worlds. Read more about how to manage the lines at Universal Orlando.